Our eyes generally can’t differentiate if our monitor are currently displaying the accurate color or not. This reason is why display calibration colorimeter are invented in the first place. In fact it doesn’t matter too much if it’s only for personal used, but if you are going to send or view the image professionally, at least you have to get the image right. Colorimeter are commonly used by professional, however it doesn’t mean you can’t use it too. If you are in need for display calibration tool, in this article we will introduce you to two X-Rite tool which are Colormunki Display and Smile. Colormunki display is a calibration colorimeter that was produced by X-Rite. Calibration colorimeter is a tool that you can used to calibrate monitors and projectors. The tool comes with an easy to use software that packed with features which is users friendly even for amateurs and experts. So they will easily fine tune their devices in an attempt to show the best possible color accuracy. Before you can use the tool, you have to download the latest version of Colormunki Display software. You can get the software at the company’s website. This tool is commonly used by professional to calibrate display, whether in photography, design or another field that required having a correctly calibrated display. Being able to use the tool properly might also sign whether you can do your job well or not. The Colormunki Display is an affordable monitor calibration device that promised you its advanced control but is also very easy to use. This tool is capable of profiling wide gamut display and projectors. When you first time open the package, you will find the colorimeter and diffuser panel along with software and a quick start guide. Taken from techradar, Colormunki display is able to measured ambient light while also taking display flare into consideration, moreover the process is only need about 10 minutes from start to finish. The result of this tool are appear quite accurate, it also provides sample of quick before and after comparison post calibration. After the software is installed, ambient light reading may be taken and calibration can begin. The guide explain almost everything quite easy to understand and just in case you are stuck, you can still source on video tutorial. The Colormunki display will take around two minutes to adjust the display luminance using a series of patches, after that the remainder are going to be displayed and measured, which will take an additional five minutes to be done. When it is on process, you will be given an approximate timing about the whole process. After it is done, you will also be provide with before and after comparison by using a range of images. The Colormunki Smile was released in 2012 as an attempt of X-rite to compete against DataColor’sSpyder 4 Express. This colorimeter is offer in a pretty low range of price to align with its competitor. Smile offer a real alternative to people with limited budget to spend. This tool is capable of ensuring your laptop or desktop monitors so they will consistently displaying the proper color values. Smile can be used to adjust LCD or LED monitor or also can be used in several monitors to maintain accuracy in each one of them. 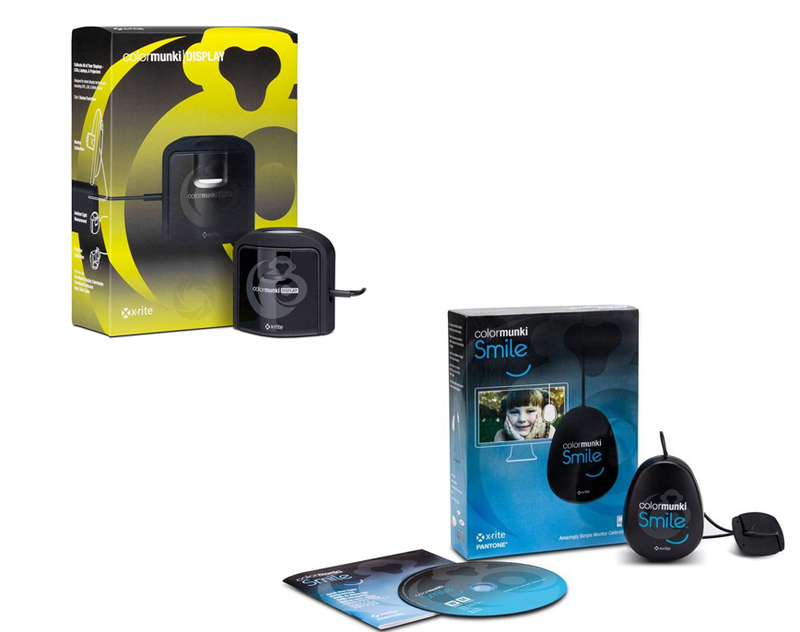 In the package you can find the Colormunki Smile monitor colorimeter with its installation CD and the booklet. A surprising fact about Colormunki Smile is that the colorimeter you are going to get is in fact an old recondition of Eye One Display 2. Many people are concern about this, since it means that your product is not 100% new. The old Eye One Display 2 is reconditioned because it cannot calibrate the recent wide gamut monitors. When in use Colormunki Smile will automatically notify you the time when you should re-calibrate your displays, this can help you maintaining color accuracy across all of your monitors. This tool is able to help you ascertain proper color accuracy and consistency, whether you are using only one monitor or several at once. The tool is also straightforward and easy to use with simple software, so you don’t need to be knowledgeable about color science. The Smile also provide videos in case you are stuck to help as troubleshooting assistance and put an end to reading other manuals. As it have been mentioned above, aside from its features you might want to consider their price. It is clear that Smile is cheaper than the Display. However the Display is said to have better accuracy and precision than the other. If you are a professional or attempting to be one, we highly recommend you the Colormunki Display over Smile. But if you have limited budget to spend and only plan to use color calibration for personal used, you might want to opt for the Smile. One thing that you might also want to consider is if you are going to purchase Smile, you have to be aware that the product you are going to get is a recondition of Eye One Display 2.